Caitlin is originally from Columbia and decided to move back home to start her career. She worked for a short time in Knoxville, but when the opportunity came available at MTBJ she couldn’t pass it up. Caitlin previously worked at MTBJ as a clinical assistant in 2007 before joining the clinic as a full time employee in 2010. Caitlin notes that the biggest changes in orthopedics have been the expansion of surgery options for several of the MTBJ surgeons, including total ankles, total elbows, and different types of total knees. Additionally, new injections like Synvisc One and Gel One have evolved over the last few years, in addition to expanded treatments for osteoporosis. The biggest change in the clinic has been the introduction of electronic health records to the practice. Professionally, Caitlin is most proud of completing her studies to become a PA. She describes the long hours spent studying to pass the certification exams as the hardest, most time consuming part of her life. She is proud of many things – for surviving the exams, for her husband who pushed her and supported her all the way through, and she is also proud to work at MTBJ! Caitlin also has pride for her amazing husband and for God for sending him to her, and for her amazing and supportive family. 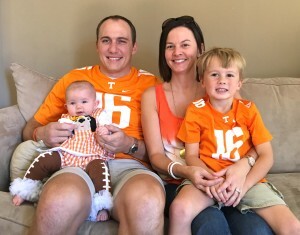 Caitlin and her husband Wyatt live in Spring Hill with their two children, Max and Catherine. Caitlin loves to run and water ski, and also loves to attend UT football games.